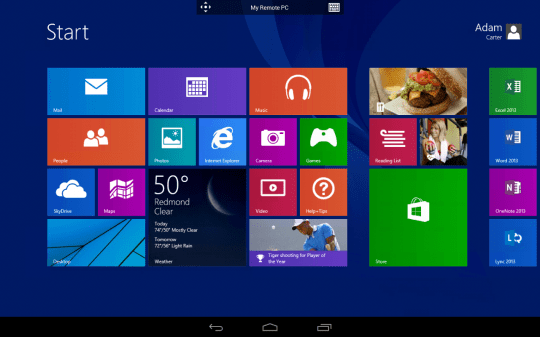 Windows 8.1 has just landed on the scene and it seems that Microsoft also has a surprise for Android users. It has just launched its promised Remote Desktop app for Android and iOS earlier than the expected end of the month release. Last week, Microsoft made it known that it was planning to make available native apps on Android and iOS that would make it possible to control Windows machines from mobile devices via its Remote Desktop Protocol (RDP) technology. It was also speculated that this app would even enable the use of familiar Windows 8 gestures, which would be quite handy when controlling such a machine from a tablet. And indeed, that seems to be the case. The Microsoft Remote Desktop app uses up the whole screen to display the remote Windows desktop, save for the Android panel on tablets. The apps seems to work seamlessly on both Windows 8 touch and desktop modes and supports multi-touch gestures, presuming your Android device supports multi-touch. It does seem to make use of Windows 8?s own keyboard rather than the native Android keyboard when text input is required. But more than just a remote desktop control, the app also allows access to remote resources via the Remote Desktop Gateway that heavy users of Microsoft’s remote desktop services would be familiar with. The app also supports high quality video and audio streaming, though we still have to try that out. The Microsoft Remote Desktop is available for free and already up on Google Play Store, so hit the download link below if you’re interested in trying it out, maybe with your newly updated Windows 8.1 machine.